Jess is the owner of Periwinkle Jazz, an online clothing boutique for boys and girls up to age 4. The business has been run out of her home in Bremen for the last 8 years. Hip Threads for Tiny Tots is the perfect tagline for this adorable business. Jessica Rohdes began making clothes for her yet-to-be-born child out of vintage fabrics. She soon had so much for that she decided to start selling it. Before her baby was even born! You won't find any vintage fabric dresses in her shop now, though! Jessica now operates a super successful clothing boutique with a focus on little boys clothes, ironic since 3 of her 4 children are girls. Her initial concept of ultra-girly handmade clothes has shifted to a graphically designed set of mostly shorties and harem pants. She couldn't find the items she had in mind while shopping for her little boy, so what's a girl with a sewing machine to do? Make them! She has some rompers, bathing suits, and girl's shirts, too, but boys clothing is by far the most popular. Her fabrics are handpicked from the best quality and designs she can find, largely in a black and white color palette. One of her best selling items is the camo shorties. 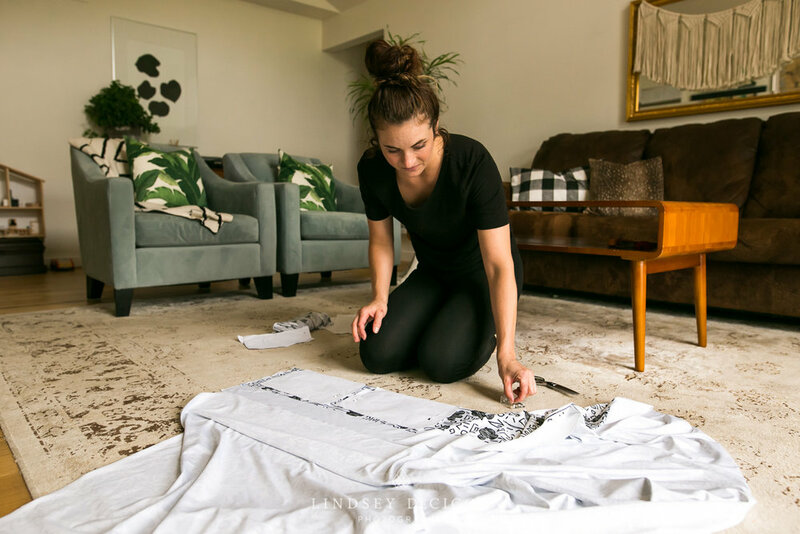 What's even more fun about her business, is that Jess has been designing her own fabrics for about 2 years with the help of a commissioned artist. Pirate maps and Mickey Mouse are featured in a couple of her own fabrics. Her first design featuring the Hundred Acre Wood is still very popular today. Due to Jessica's love of children's literacy, a lot of her inspiration comes from childhood characters and stories. She has been working on Summer Book Club with book and toy giveaways that inspired clothing designs. They are cute. Periwinkle Jazz employs several seamstresses and fabric cutters. Jess is mostly working on the business side these days, largely from her phone! She is managing orders, inventory, creating new designs and sewing custom work. Her stock/sewing room is right off her children's basement playroom. While the older two are in school, the youngest two are really great about playing while she works. She gets to be a stay-at-home-mom and a successful entrepreneur at the same time! When she is cutting fabric in the living room, she can watch her children play in their big back yard, and her dining room table serves as a hub for gathering materials flat-lay photography for Instagram. She also ships from there. I was super impressed with how she has made this process work from her home without it looking like a warehouse. She has a beautiful house and you'd never be able to tell what a big business she is running from inside it. Jess is sweet, smart and successful and it was such a pleasure getting to see how she operates Periwinkle Jazz. She swears she is just a mom like you and I, only she makes clothes, too. I can see that there is a lot more to her than that, and I bet you can, too! The customers keep her going, especially when they send her pictures of some really amazing moments. One customer used her clothes for her baby's first year's worth of pictures without her knowing it. It then inspired that mother to hang the clothes like bunting at the birthday party it created the whole theme for the celebration. It would be so amazing knowing that your handmade work was going to be remembered in such an awesome way for that child's whole life. You can find her on Instagram and at her own shop's page which she has just moved from Etsy. Go show her some love, and be sure to order something! PS- This is my little man a few years ago in his first Periwinkle Jazz item. All the heart eyes.